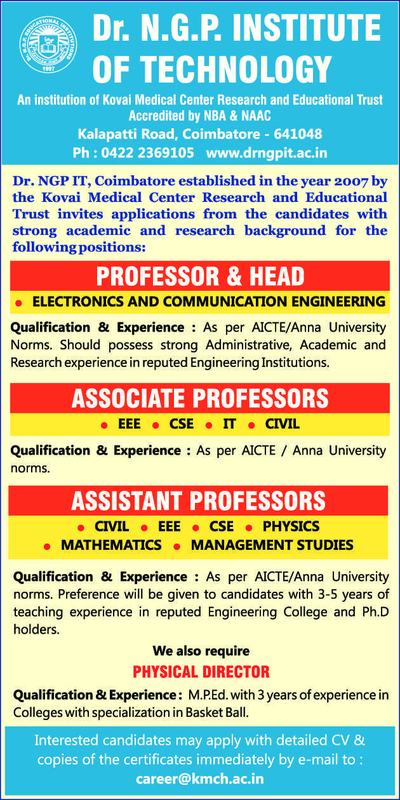 Dr.N.G.P Institute of Technology Coimbatore has advertised in THE HINDU newspaper for recruitment of Professor / Associate Professor / Assistant Professor / Head Plus Non-Faculty jobs vacancies. Interested and eligible job aspirants are requested to apply immediately from 20th June 2018. Check out further more details below. About College: Dr. Nalla.G.Palaniswami - A name that is taken with great reverence by the medical fraternity and common public alike, for his pioneering efforts in providing quality healthcare. Since its inception in 1989, the Kovai Medical Center and Hospital or KMCH as we know it, has been redefining the corporate hospital set up, making healthcare accessible to all, catering to patients from all over the globe. Looking beyond its success and recognizing the need for competent technical education, Dr.N.G.P initiated the establishment of Dr.N.G.P. Institute of Technology in 2007, and the N.G.P. Group of educational institutions.